If you’re a watch aficionado, then we’re in the same boat, we’re trying the digest all the news coming from Geneva and we tend to forget those that are taking their first steps as a watch brand. Let me bring to your attention Seals Watch Co, a microbrand that is currently on its way to raise funds for their debut collection, the Module A. When designing the Module A collection, Michael Seals, the founder of the company and the son of a tank mechanic has turned to the utilitarian shape of tanks from the 1940’s and the distinctive bodywork of the classic cafe racer motorcycle. The result is a 41 mm x 51 mm x 12 mm stainless steel piece with a masculine design. 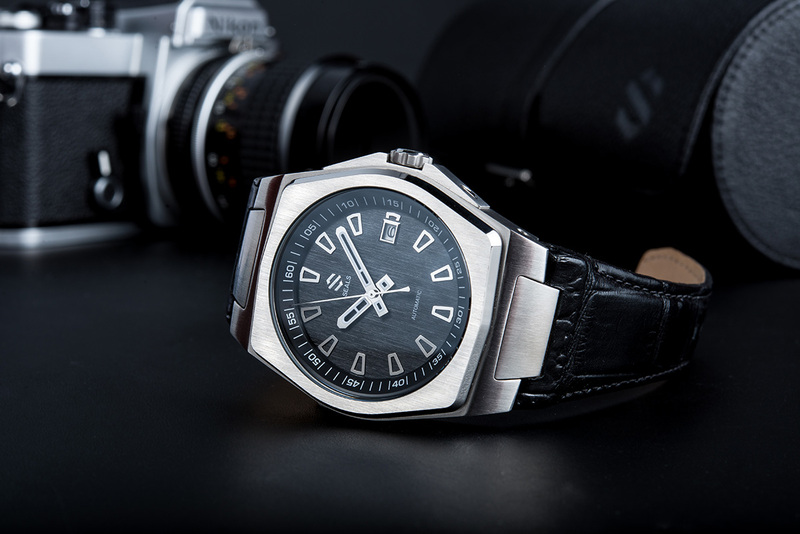 Powered by the usual Miyota 9015, it comes in four flavours: an exposed 316L stainless steel with a vertically brushed white dial, another with black dial, plus an option coated with true-black or slate Physical Vapor Deposition (PVD). At the time of writing this story, Seals Watch Co. managed to raise more than 50% of its target with still one more month to go. As an “early bird” backer, you can reserve your Module A for $520, with shipping expected to start as early as June. For more about Seals Watch Co and its campaign go to http://kck.st/14OUTc5.